Geodude in game: 13,422 Who? Important notice! Pokemon Geodude is a fictional character of humans. Geodude (Japanese: イシツブテ Isitsubute) is a dual-type Rock/Ground Pokémon introduced in Generation I. It evolves into Graveler starting at level 25, which evolves into Golem when traded. In Alola, Geodude has a regional variant that is Rock/Electric. It evolves into Alolan Graveler starting at level 25, which evolves into Alolan Golem when traded. 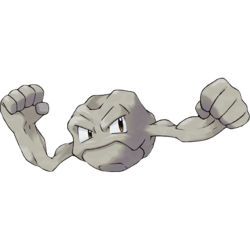 Geodude is a gray boulder Pokémon. It has bulging, rocky eyebrows and trapezoidal, brown eyes. Its arms are muscular with five-fingered hands. Geodude uses its arms to climb steadily up steep mountain paths. Geodude is proud of its sturdy body and will bash against others of its kind in a contest of sorts to prove whose body is harder. The longer it lives, the more chipped and worn its body becomes. Geodude can be most often found on mountain trails and fields. It will sit still in these areas, which is why it is often mistaken for a rock. It is often stepped on, and will sometimes swing its arms in anger when this occurs. When Geodude sleeps deeply, it buries itself halfway into the ground. Once buried, it will not awaken even if someone steps on it. In the morning, Geodude rolls downhill in search of food. The Geodude of the Alola region are made from a magnetic rock which grants them the Electric-type. There are areas on the Alolan Geodude's body that are especially magnetic and attracts iron sand, composing the appearance of black eyebrows and strands of short black hair. Only the thumb and index fingers on the Geodude's hands are free while the other fingers have fused together. Brock had a Geodude that he used in Kanto and Johto before giving it to his brother, Forrest, on his departure to Hoenn. Danny, the Navel Island Gym Leader, used one to help compose and ride a sled as part of the challenges in Navel Maneuvers. It reappeared in a flashback in A Way Off Day Off and in another flashback in Hello, Pummelo!. Roxanne used one in her battle with Ash in Winner by a Nosepass. 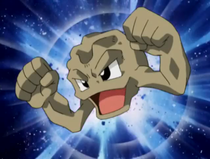 Geodude and its evolved forms were the loyal subjects of King Onix in Hooked on Onix. Roark used his Geodude against Paul in Shapes of Things to Come! and Ash in O'er the Rampardos we Watched!. A group of Geodude also appeared in Genesect and the Legend Awakened battling the Genesect Army at Pokémon Hills. Multiple Geodude appeared in Battle Aboard the St. Anne. A Geodude was among the Pokémon seen at Professor Oak's Laboratory in Showdown at the Po-ké Corral. A pink Geodude appeared in Team Rocket's fantasy in In the Pink. A Geodude under the ownership of an unnamed Trainer was treated by Nurse Joy in The Joy of Pokémon. Geodude also appeared in The Power of One. A Geodude was one of the sick Pokémon in a Pokémon Center in Carrying On!. A fantasized Geodude appeared in Beauty and the Breeder where it participated in a Pokémon beauty contest. A Geodude was partnered with two Team Rocket trainees in Training Daze. Multiple Geodude also appeared in Celebi: Voice of the Forest, Pokémon Heroes: Latios & Latias and Destiny Deoxys. A Geodude made a brief cameo in Lucario and the Mystery of Mew and Giratina and the Sky Warrior. Several Geodude and its evolved form, Graveler, appeared in Steeling Peace of Mind! and Saving the World From Ruins!. Two Geodude made a cameo in Arceus and the Jewel of Life. 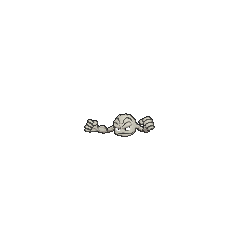 A Geodude made a brief appearance under the ownership of a Trainer in the Lily of the Valley Conference in An Old Family Blend!. AG016 Geodude May's Pokédex Geodude, the Rock Pokémon. Geodude has incredibly high defensive power, making it virtually resistant to any physical attacks. DP015 Geodude Dawn's Pokédex Geodude, the Rock Pokémon. Geodude is often found on mountain roads with half of its body buried in the ground so it can observe mountain travelers. Brock's Geodude appeared in File 1: Red, where it fought Red's Charmander and Nidoran♂. It was almost able to defeat Charmander, but lost to Nidoran♂ after Brock told Red about type advantages and switched out his Charmander. Brock uses a Geodude in The Electric Tale of Pikachu. He uses it in his Gym battle against Ash in Play Misty For Me. In Onix is On! a Geodude appears floating next to Brock. He is later seen with six Geodude forming a belt around his jacket in the Yellow chapter. The Geodude sextet is later seen in The Last Battle III, attempting to halt the Magnet Train with a combined Magnitude. Each of them are nicknamed from Geoone to Geosix. A Geodude appeared in Raging Rhydon, as a wild Pokémon. Later in Tauros the Tyrant a Team Rocket Grunt used a Geodude in an attempt to catch Green. A Geodude appeared as a silhouette when Green explains about Mew in The Jynx Jinx. A wild Geodude was seen in Union Cave hiding among the rocks in Off Course with Corsola. Shū has a Geodude in the Pokémon Gotta Catch 'Em All manga. Hareta catches a Geodude on Iron Island in Serious Training on Iron Island!!. Roark's Geodude appeared in a flashback where it tried to comfort him when he was young after his father pushed him too hard to become a Gym Leader. A Geodude appeared a cameo appearance in What do you do,Pikachu? One Geodude figure has been released. Geodude is the final Poké Float to appear. As the Unown float around the top half of the screen, Geodude floats across the bottom with its arms outstretched, providing a solid base for fighting. After it leaves the screen, there will be no Poké Floats on the screen for a few seconds, before Squirtle pops up and restarts the cycle. Commonly found near mountain trails, etc. If you step on one by accident, it gets angry. When traveling uphill, if it encounters a raised step, it cleverly hoists itself up and over using its two arms. Most people may not notice, but a closer look should reveal that there are many Geodude around. It uses its arms to steadily climb steep mountain paths. It swings its fists around if angered. Proud of their sturdy bodies, they bash against each other in a contest to prove whose is harder. When Geodude sleeps deeply, it buries itself halfway into the ground. It will not awaken even if hikers step on it unwittingly. In the morning, this Pokémon rolls downhill in search of food. It climbs mountain paths using only the power of its arms. Because they look just like boulders lining paths, hikers may step on them without noticing. Its round form makes it easy to pick up. Some people have used them to hurl at each other in a snowball fight. Many live on mountain trails and remain half buried while keeping an eye on climbers. It is impossible to distinguish from rocks. It slams against others in contests of hardness. Its round body makes it easy to pick up, but it is hard and heavy. It's dangerous to play with them as if they were snowballs. There are plenty of them to be found along any road. A scholar with too much free time once counted a hundred of them along a single route. If you accidentally step on a Geodude sleeping on the ground, you'll hear a crunching sound and feel a shock ripple through your entire body. Alolan Geodude has the same stats as a regular Geodude. All damage-dealing Normal-type moves will get STAB when used by Alolan Geodude if it has the Ability Galvanize. Moves marked with a superscript game abbreviation can only be bred onto Geodude in that game. 51%-100% HP My control's great for picking up and pitching rocks! Geodude may be found lying on the ground. It has the power to crush small rocks. It triggers rockfalls to attack. Geodude can often be found playing in the Cavern Zone. They really enjoy Blaziken's Boulder Bash! They are Rhyperior's friends, but they are treated like his subordinates. It bothers them a bit. 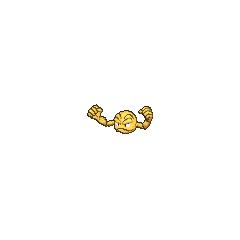 For other sprites and images, please see Geodude images on the Bulbagarden Archives. No other Pokémon has the same type combination as Alolan Geodude and its Alolan evolutionary relatives. Alolan Geodude, along with its Alolan evolutionary relatives, were designed by Hitoshi Ariga. Alolan Geodude has the lowest Speed base stat of all Electric-type Pokémon. In the Japanese game Pokémon Blue, Geodude weighs 2.0 kg instead of 20.0 kg (as it does in all other games). This has no mechanical significance, as no game mechanics use weight in the handheld Generation I games. Geodude is based upon a living rock or boulder. Geodude may be a combination of the prefix geo-, from γῆ gē, Greek for earth, and dude, a slang word for a male. It may also be from geode, a usually hollow volcanic rock with crystal inside, and dude. Isitsubute is a combination of 石 ishi (stone) and 礫 tsubute (throwing stones). Cantonese Chinese 小拳石 Síukyùhnsehk Literally "Small fist rock"
Mandarin Chinese 小拳石 Xiǎoquánshí Literally "Small fist rock"